For other uses, see Tool (disambiguation) and Equipment. While one may apply the term tool loosely to many things that are means to an end (e.g., a fork), strictly speaking an object is a tool only if, besides being constructed to be held, it is also made of a material that allows its user to apply to it various degrees of force. If repeated use wears part of the tool down (like a knife blade), it may be possible to restore it; if it wears the tool out or breaks it, the tool must be replaced. Thus tool falls under the taxonomic category implement, and is on the same taxonomic rank as instrument, utensil, device, or ware. Finds of actual tools date back at least 2.6 million years in Ethiopia. One of the earliest distinguishable stone tool forms is the hand axe. Up until recently, weapons found in digs were the only tools of “early man” that were studied and given importance. Now, more tools are recognized as culturally and historically relevant. As well as hunting, other activities required tools such as preparing food, “…nutting, leatherworking, grain harvesting and woodworking…” Included in this group are “flake stone tools". 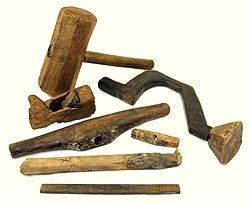 Tools are the most important items that the ancient humans used to climb to the top of the food chain; by inventing tools, they were able to accomplish tasks that human bodies could not, such as using a spear or bow and arrow to kill prey, since their teeth were not sharp enough to pierce many animals' skins. “Man the hunter” as the catalyst for Hominin change has been questioned. Based on marks on the bones at archaeological sites, it is now more evident that pre-humans were scavenging off of other predators' carcasses rather than killing their own food. Mechanical devices experienced a major expansion in their use in Ancient Greece and Ancient Rome with the systematic employment of new energy sources, especially waterwheels. Their use expanded through the Dark Ages with the addition of windmills. Machine tools occasioned a surge in producing new tools in the industrial revolution. Advocates of nanotechnology expect a similar surge as tools become microscopic in size. Cutting and edge tools, such as the knife, scythe or sickle, are wedge-shaped implements that produce a shearing force along a narrow face. Ideally, the edge of the tool needs to be harder than the material being cut or else the blade will become dulled with repeated use. But even resilient tools will require periodic sharpening, which is the process of removing deformation wear from the edge. Other examples of cutting tools include gouges and drill bits. Moving tools move large and tiny items. Many are levers which give the user a mechanical advantage. Examples of force-concentrating tools include the hammer which moves a nail or the maul which moves a stake. These operate by applying physical compression to a surface. In the case of the screwdriver, the force is rotational and called torque. By contrast, an anvil concentrates force on an object being hammered by preventing it from moving away when struck. Writing implements deliver a fluid to a surface via compression to activate the ink cartridge. Grabbing and twisting nuts and bolts with pliers, a glove, a wrench, etc. likewise move items by some kind of force. Tools that enact chemical changes, including temperature and ignition, such as lighters and blowtorches. Shaping tools, such as molds, jigs, trowels. Fastening tools, such as welders, rivet guns, nail guns, or glue guns. Some tools may be combinations of other tools. An alarm-clock is for example a combination of a measuring tool (the clock) and a perception tool (the alarm). This enables the alarm-clock to be a tool that falls outside of all the categories mentioned above. There is some debate on whether to consider protective gear items as tools, because they do not directly help perform work, just protect the worker like ordinary clothing. They do meet the general definition of tools and in many cases are necessary for the completion of the work. Personal protective equipment includes such items as gloves, safety glasses, ear defenders and biohazard suits. Often, by design or coincidence, a tool may share key functional attributes with one or more other tools. In this case, some tools can substitute for other tools, either as a makeshift solution or as a matter of practical efficiency. "One tool does it all" is a motto of some importance for workers who cannot practically carry every specialized tool to the location of every work task; such as a carpenter who does not necessarily work in a shop all day and needs to do jobs in a customer's house. Tool substitution may be divided broadly into two classes: substitution "by-design", or "multi-purpose", and substitution as makeshift. Substitution "by-design" would be tools that are designed specifically to accomplish multiple tasks using only that one tool. Substitution as makeshift is when human ingenuity comes into play and a tool is used for its unintended purpose such as a mechanic using a long screw driver to separate a cars control arm from a ball joint instead of using a tuning fork. In many cases, the designed secondary functions of tools are not widely known. As an example of the former, many wood-cutting hand saws integrate a carpenter's square by incorporating a specially shaped handle that allows 90° and 45° angles to be marked by aligning the appropriate part of the handle with an edge and scribing along the back edge of the saw. The latter is illustrated by the saying "All tools can be used as hammers." Nearly all tools can be used to function as a hammer, even though very few tools are intentionally designed for it and even fewer work as well as the original. Tools are also often used to substitute for many mechanical apparatuses, especially in older mechanical devices. In many cases a cheap tool could be used to occupy the place of a missing mechanical part. A window roller in a car could easily be replaced with a pair of vise-grips or regular pliers. A transmission shifter or ignition switch would be able to be replaced with a screw-driver. Again, these would be considered tools that are being used for their unintended purposes, substitution as makeshift. Tools such as a rotary tool would be considered the substitution "by-design", or "multi-purpose". This class of tools allows the use of one tool that has at least two different capabilities. "Multi-purpose" tools are basically multiple tools in one device/tool. Tools such as this are often power tools that come with many different attachments like a rotary tool does, so you could say that a power drill is a "multi-purpose" tool because you can do more than just one thing with a power drill. A multi-tool is a hand tool that incorporates several tools into a single, portable device; the Swiss army knife represents one of the earliest examples. Other tools have a primary purpose but also incorporate other functionality – for example, lineman's pliers incorporate a gripper and cutter, and are often used as a hammer; and some hand saws incorporate a carpenter's square in the right-angle between the blade's dull edge and the saw's handle. This would also be the category of "multi-purpose" tools, since they are also multiple tools in one (multi-use and multi-purpose can be used interchangeably – compare hand axe). These types of tools were specifically made[by whom?] to catch the eye of many different craftsman who traveled to do their work. To these workers these types of tools were revolutionary because they were one tool or one device that could do several different things. With this new revolution of tools the traveling craftsman would not have to carry so many tools with them to job sites, in that their space would be limited to the vehicle or to the beast of burden they were driving. Multi-use tools solve the problem of having to deal with many different tools. Observation has confirmed that a number of species can use tools including monkeys, apes, elephants, several birds, and sea otters. Philosophers originally thought that only humans had the ability to make tools, until zoologists observed birds and apes making tools. 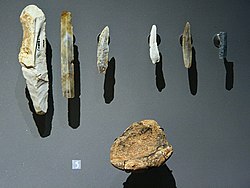 Now the unique relationship of humans with tools is considered to be that we are the only species that uses tools to make other tools. A telephone is a communication tool that interfaces between two people engaged in conversation at one level. It also interfaces between each user and the communication network at another level. It is in the domain of media and communications technology that a counter-intuitive aspect of our relationships with our tools first began to gain popular recognition. Marshall McLuhan famously said "We shape our tools. And then our tools shape us." McLuhan was referring to the fact that our social practices co-evolve with our use of new tools and the refinements we make to existing tools. ^ Whiten, A., J. Goodall, W.C. McGrew, T. Nishida, V. Reynolds, Y. Sugiyama, C.E.G. Tutin, R.W. Wrangham, and C. Boesch. 1999. Cultures in Chimpanzees. Nature 399:682—85. Panger, M.A., A.S. Brooks, B.G. Richmond, and B. Wood. 2002. Older than the Oldowan? Rethinking the emergence of hominin tool use. Evolutionary Anthropology: Issues, News, and Reviews 11:235–45. ^ McPherron, Shannon P.; Zeresenay Alemseged; Curtis W. Marean; Jonathan G. Wynn; Denne Reed; Denis Geraads; Rene Bobe; Hamdallah A. Bearat (2010). "Evidence for stone-tool-assisted consumption of animal tissues before 3.39 million years ago at Dikika, Ethiopia". Nature. 466 (7308): 857–60. Bibcode:2010Natur.466..857M. doi:10.1038/nature09248. PMID 20703305. ^ Semaw, S., M.J. Rogers, J. Quade, P.R. Renne, R.F. Butler, M. Domínguez-Rodrigo, D. Stout, W.S. Hart, T. Pickering, and S.W. Simpson. 2003. 2.6-Million-year-old stone tools and associated bones from OGS-6 and OGS-7, Gona, Afar, Ethiopia. Journal of Human Evolution 45:169–77. ^ Holmes, Bob. "Man's early hunting role in doubt". Newscientist.com. Retrieved 12 November 2012. ^ Paul, Akshoy; Roy, Pijush; Mukherjee, Sanchayan (2005), Mechanical sciences: engineering mechanics and strength of materials, Prentice Hall of India, p. 215, ISBN 81-203-2611-3. ^ Asimov, Isaac (1988), Understanding Physics, New York City: Barnes & Noble, p. 88, ISBN 0-88029-251-2. ^ Anderson, William Ballantyne (1914). Physics for Technical Students: Mechanics and Heat. New York City: McGraw Hill. pp. 112–22. Retrieved 2008-05-11. ^ Calvin, William H. "The Throwing Madonna: Essays on the Brain". ^ "Chimp Minds, on season 15, episode 4". Scientific American Frontiers. Chedd-Angier Production Company. 2005. PBS. Archived from the original on 2006. ^ "Rolling Hills Wildlife Adventure: Chimpanzee". Archived from the original on 2016-05-23. ^ Bjorklund, David F.; Bering, Jesse M. (5 June 1997). "Big brains, slow development and social complexity:The development and evolutionary origins of social cognition". In Cooper, Cary L. (ed.). International review of industrial and organizational psychology. Robertson, Ivan T. John Wiley and Sons. p. 113. ISBN 978-0-471-96111-6. Retrieved 10 July 2011.